Fist of Jesus, the somewhat blasphemous brawler from Kiss Ltd. and developer Mutant Games, is now available on digital platforms. Contrary to popular belief, Jesus’ ability to walk on water was not a divine feat, but mad ninja skills at work. 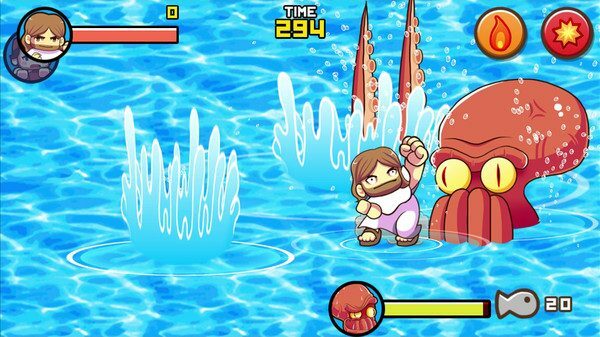 Fist of Jesus is not a game you want to go into if you are offended by zombies, beat ’em ups, or the idea of the son of God giving a legionnaire an uppercut. If you’re good with all those things, though, then it may very well be the indie game for you. The game is based (very mildly… very very mildly,) on the story of the resurrection of Lazarus. Only this time, something’s been cocked up, and what do you know if Jesus hasn’t accidentally released an Iron Age zombie apocalypse on the people. When that kind of thing happens calling on Daddy to fix it simply isn’t an option: using your fists to punch an undead sucker in the face (or just a sucker, in the case of the octopus,) is the only way to go. What follows is for the most part a typical 2D beat ’em up, complete with special moves, quirky/cute graphics, and according to a lot of user feedback, some pretty cruddy controller support. The developers claim the game is “Life of Brian meets gore and humor,” and the game definitely sets its sites on having both in spades. Other than some difficulties with the controls general user response seems mostly positive, too, always a good thing right? Fist of Jesus is available now on your favorite digital distribution platform, including Steam, and for a short time is available at 20% off the normal retail price. But wait, there’s more! Fist of Jesus is not the only game Kiss Ltd. has released today: also available is DarkEnd, the Myanmar-based top-down RPG we talked about a couple of weeks ago. Why not check out both?